The nationwide nursing shortage is contributing to increased employment opportunities for LPNs in Oregon. The State of Oregon Employment Department estimates LPN job growth of nearly 20 percent from 2012 to 2022, a faster rate than the statewide average for all occupations. With an LPN education, aspiring nurses can take advantage of this growth. Before settling on an LPN program, prospective students should take time to research school options to make sure they earn an accredited education that will be respected by employers and approved by the state. Continue reading to learn more about LPN programs and careers in Oregon, including a list of top-ranked schools, an overview of state licensure requirements, as well as salary and employment trends by area. LPN programs are offered at a variety of public and private colleges around the state of Oregon. This search tool can help prospective LPNs narrow their results based on preferences for tuition rate, school size/type, and degree options. All practicing vocational and practical nurses must be licensed to work in the U.S., but the licensing process varies from state to state. This section explains the process of becoming licensed and maintaining licensure in the state of Oregon. LPN eligibility is based on the applicant’s nursing education. To qualify for a license, applicants must have completed one of the state-approved LPN programs in Oregon resulting in a practical nursing certificate, diploma, or associate degree. Because Oregon has not yet entered into the compact for interstate licensure, graduates of out-of-state nursing degree programs are still required to become licensed in Oregon. Applicants for licensure who have not graduated from a state of Oregon-approved nursing program must have practiced for at least 960 hours within the last five years or complete an OSBN-approved re-entry program within the last two years to satisfy the education requirement. Nurses with out-of-state licenses can apply for an LPN Limited License while waiting to complete a re-entry program. Late renewal applications are accepted within 60 days of the expiration date. The online application automatically calculates late fees. After 60 days, expired licenses must be reactivated, which includes additional fees and a national background check. Practicing without a license can result in a civil penalty of up to $5,000. Opportunities for employment can be found all over the state, but certain regions of Oregon pay higher salaries than others. This table identifies the areas of Oregon where LPNs earn the most. According to the State of Oregon Employment Department (SOED), the number of LPNs in the state is expected to grower faster than the average growth rate for all occupations. Specifically, SOED projects an increase of 19.9 percent between 2012 and 2022 and 120 openings annually (including replacement openings). The Portland-Metro area has the highest population in the state and employs the most LPNs. They will experience higher employment growth compared to smaller counties such as Clackamas and East Cascades. This LPN association provides continuing education opportunities, lobbying services, an annual convention. OSBN publishes this guide for RNs and LPNs in Oregon. 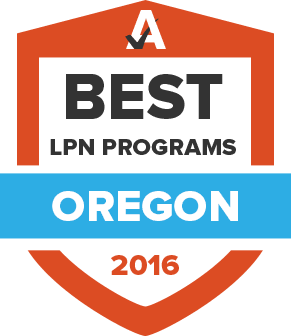 This is the list of approved LPN programs from the Oregon State Board of Nursing. This site for Oregon RNs and LPNs publishes educational offerings, cultural competence digests, and a quarterly newsletter. Members can also access the podcast Oregon Nursecast. Oregon Nurses Association (ONA) offers a dues reduction for new graduates, scholarship opportunities, and the monthly publication Oregon Nurse, as well as leadership and training opportunities for LPNs. Oregon Nurses Foundation (ONF) is a charitable organization that seeks to advance the profession of nursing by providing scholarships, workforce assistance, and retention programs for RNs and LPNs. The Oregon State Board of Nursing (OSBN) regulates LPN licensure and practice in the state of Oregon. Licensing and renewal information and forms are available at this site. Oregon Student Nurses Association (OSNA) supports student nurses in their pursuit of professional LPN careers by offering discounts on national dues, NCLEX study materials, and nursing journal subscriptions. This is the complete set of standards for LPNs set by Oregon State Board of Nursing. This diverse nursing community provides discounts on conference registration fees, subscriptions to publications, and networking opportunities for RNs and LPNs in Oregon.